Two years in advance of grand celebration of the 150th year of the inception of Ringstrasse, the elegant avenue in Vienna’s 1st Bezirk notorious for magnificent edifices erected during the most grandiose urban reconstruction planned in the more recent history of Europe, the Austrian Capital marks the 2nd Centenary of the birth of the Danish architect Theophil Hansen (1813-1891), the man that left a durable imprint upon the City as it is today. Greece – freshly liberated from Turkish occupation – was becoming the meeting place of artists from all over the world, eager to study the heritage of Antiquity; responding to the invitation of the Bavarian prince Otto (who was elected King of Greece), Athens was receiving many experts that tried their skills in the reconstruction of the City. Theophil Hansen achieved there his first great commissions, including design of the Athenian Observatory, construction of several residences in Greek-Byzantine style, still-extant Hotel Grande-Bretagne at the Syntagm Square, edifice of the Academy of Sciences (in 1866), Greek National Library (1885), The Zappeion (1888) – where central events of the first Olympic Games of our Aera took place, as well as reconstruction of the Monument of Lysicrates. Hansen’s Athenian architectural activities ended in 1843, when King Otto – pressed by Greek nationalists – cancelled foreign artistic commissions. Hansen remained in Athens for a while, surveying works on constructions he started earlier until he was given a chance to start another splendid professional career, this time in Austria. 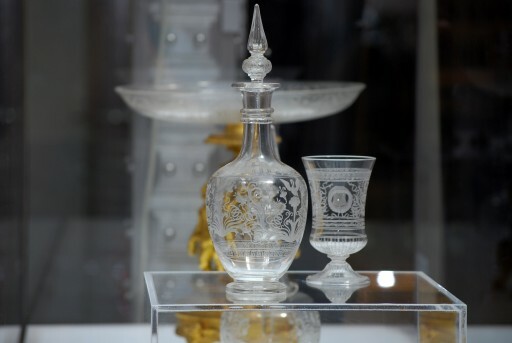 Recommended by the Vice-Consul of Greece and one of the richest enterpreneurs and bankers in Austria and Hungary Baron Georg Simon von Sina (born Georgios Sinnas), one of the most famous contemporary architects of the Imperial City of Vienna, Ludwig von Förster, extended invitation to Hansen to join his firm. 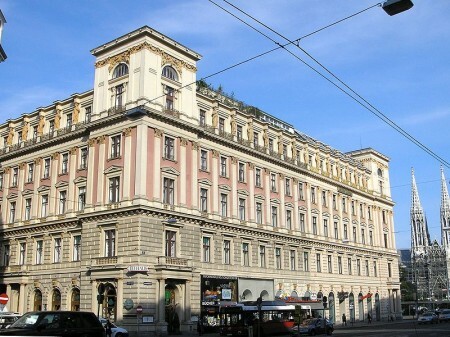 Working in Förster’s bureau, Hansen designed several neoclassicist residential houses, but also some hotels and the Gustav Adolph Church in 6th Bezirk (1847-1849). 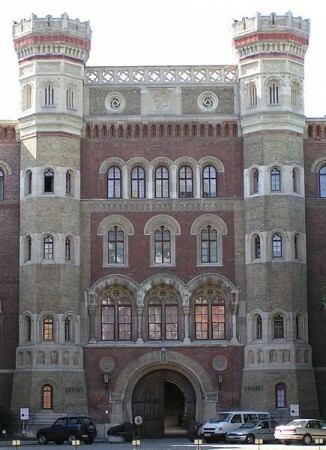 Having accomplished designs for the Arsenal, where he authored the entire concept of the Military History Museum (Heeresgeschichtliches Museum), Hansen was promoted to the position of star architect of Vienna, giving him opportunity to start independent business. He received many commissions, starting with Palazzo Sinna in Venice, and continuing with projects in present Austria, Moravia, Romania, Ukraine and Slovenia. In the period 1851-1859 he accomplished many projects, among them Protestant School at the Karlsplaz in Vienna, Imperial hunting lodge in Herrenstein, a hospital in Lavov (Lemberg), reconstruction and enlargement of the Russian Orthodox Church in Vienna, monument of the composer Franz Schubert in Vienna’s City Park (as well as Composer’s tomb in the Währing district), chapel at the Protestant Cemetery, also in Vienna, St. Anne Hospital in Brno (at that time Brünn), as well as a number of private residences across territory of the former Austro-Hungarian Empire. Baron Alexander von Bach, Minister of the Interior, received Imperial Decree dated December 20, 1857, requesting him to provide for the better connection between centre of the City and suburbs, demolition of old fortifications and establishing principles of the regulated construction. This was start of a massive urban reconstruction of Vienna, that in size went significantly over the Haussmannian reconstruction of Paris. There was an international competition for design of an avenue 45 m wide and 4 km long, but no proposal was found acceptable. Finally, the task went to Ludwig von Förster and his proposal was approved on September 1, 1859. One of von Förster’s main assets was Theophil Hansen, who in the meanwhile became Förster’s son-in-law. von Drasche, Todesco, as well as houses of two Archdukes- Wilhelm and Rudolf, sole remnants of nobility in midst of Hansen’s rich bourgeois clients. In order to confirm the ascending social status, the urban design was required to demonstrate not only the financial competence, but also cultural achievement of the new class. Hansen designed the new Burse on the Ring, but he created some huge monuments of culture in the same area: Konzerthaus and Academy of Fine Arts. However, the crown of his architectural opus is considered to be the House of the Parliament of Austria (1883). 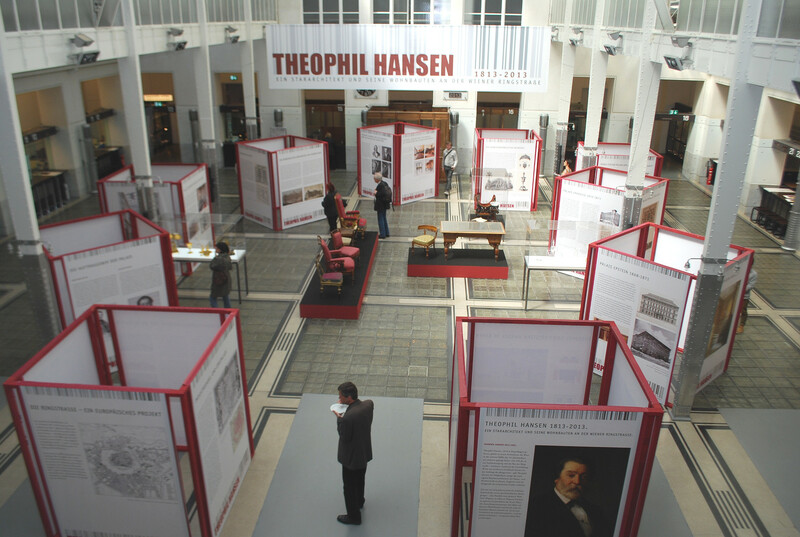 Vienna dedicates several exhibitions to Theophil Hansen, the man who introduced “Greek Style” to the Austrian Capital and who greatly influenced another great architect of Vienna, Otto Wagner. Presently, in WAGNER:WERK Museum of the Postsparkasse one may visit the display of “Theophil Hansen, the Architectural Star and his residential houses of the Ringstrasse” (through August 17), at the Academy of Fine Arts is “Theophil Hansen, the Architect and the Designer” (until August 18th), at MAK – “Theophil Hansen; Arts & Crafts” (final day October 13), while at the Ringturm, prior to September 6, one can visit “Theophil Hansen, the most important architect of the Ringstrasse” .